Here is Emma with her final post this week on Wool, Wellness and You. There is masses of information out there about the mental health benefits of knitting and crafting in general. This week we have spoken about woolness and the impact the individual can have on the community of wool. But woolness is also about the need to look after ourselves too. I wanted to share with you some fantastic organisations and resources I use every day, which has really made an impact on my own crafting and wellbeing. The Blurt Foundation (www.blurtitout.org) is an amazing non-profit social enterprise working to reduce the stigma of depression and mental health issues. Providing support, comfort, and reassurance to people who need it. Blurt works with companies, employers, schools and medical practitioners every day to provide the tools to understand depression and the devastating impacts it can have, providing the tools we need to rebuild ourselves from the inside and to live healthy fulfilled lives. I love their posts for supporting people to manage their depression. Talking about mental health not only changes lives but saves them too. Check out Blurt’s social media pages on Instagram, Twitter and Facebook for peer support and daily reminders to help you and those around you. Subscribe to their newsletter for its uncanny ability to drop into your inbox at just the moment you need it most. 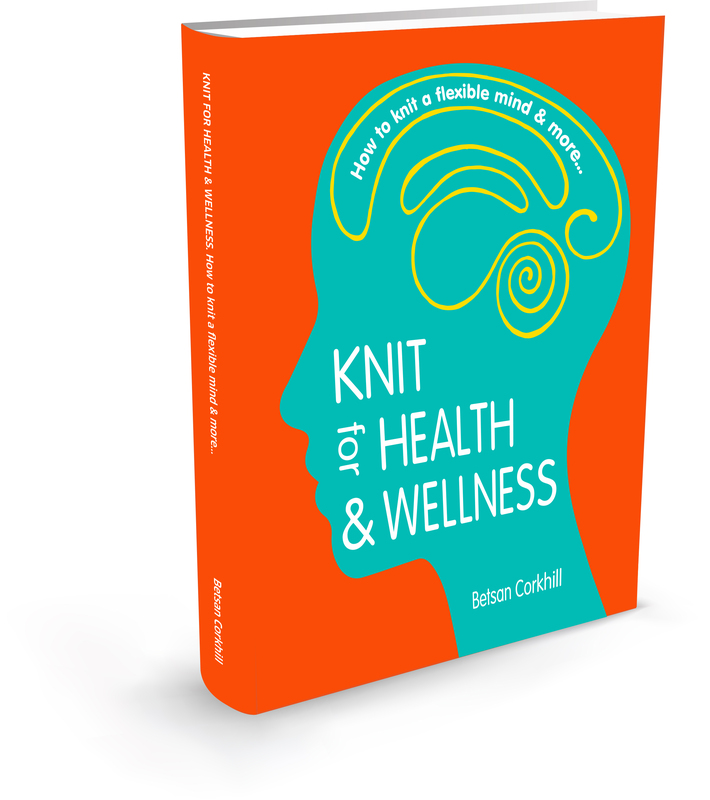 Betsan Corkhill’s Knit for Health and Wellness book is packed full of helpful tips and coping mechanisms designed for knitting and the positive impact it can have on our health and wellness. Knit for Health and Wellness rises above the usual self-help books by providing you with an accessible book which gets you actively involved in your health and wellbeing. The innovative use of knitting as a portable tool adds an extra dimension to enable you to be actively involved in transforming your own learning about wellbeing. It quite literally puts the power back in your hands. The hidden power of your hand movements influence your brain. You can create a healthy brain environment. You can create an environment where mind and body work in harmony. Knitting naturally brings about a state of mind that doctors the world over are desperately trying to encourage. Knitting can be used as a tool to help anyone. Knitting helps to erase social concerns. Knitting can help you beat loneliness. I have handed out many copies of the book as presents to other knitters and crafters in general, I can’t recommend it highly enough. If you don’t feel you’re ready for the book, try www.stitchlinks.com which features articles, research, and forums for managing change and your personal development. Stitchlinks continues to carry out groundbreaking research into this incredible topic, share your own story with them, and you could find yourself in future research projects. Ravelry and its forums are a fantastic tool to completely immerse yourself in the knitting world. You don’t have to engage with people if you’re not up to it yet. Just sit back and read but be warned- you will lose many hours and be inspired by some fantastic projects. Can’t say we didn’t warn you. Don’t forget to post your latest project on Instagram for the knitting world to see. There is a fantastic community of makers ready and waiting for all of the latest and greatest projects worldwide. – If you want to spend your Friday night knitting and netflixing… Do it! – Take time out to appreciate the small stuff, go for a walk, plan a trip. If you don’t want to go out on your own, take someone with you to share the experience. Getting out into nature is a great way to escape and breathe. Take pictures or write down what you see in a notebook to savour the moment. – Seriously, it is really important to not only look after ourselves but others in our community too. Talking about mental health is really important and its being honest with ourselves. Because when we look after ourselves by taking the time out for self-care – things happen. By showing ourselves that we are worth more, we can help each other take tiny steps forward and learn that we are worth more than we ever allowed ourselves to think was possible. We will eventually believe it, and so will you too. Emma, thank you so much for writing this week and sharing so honestly your own personal experiences and thoughtful posts on woolness. If you want to share your own #woolnessandme stories, you can do so on instagram and social media, using the hashtag. We would love to know how wool impacts positively on your life.